I used to live near Shamrock and it made me sick to see abused carriage horses warehoused in such horrible conditions. I hope the closing of this stable helps spur the end to this cruel industry, horses do not belong on the congested streets of NYC! It is time for this city to tell this whole industry to pack their bags. This industry is cruel and has NO place in this city. it causes too much congestion and poses a danger to us all. Look at video posted yesterday on youtube. few open stalls? There is no room for the existing horses. View undercover footage and pictures of these “stables”. Horrible and sad. sick horses? Yes plenty of sick horses but then who wouldn’t be sick after hauling carriages with 4 passengers all over midtown and upper west side in the middle of traffic. Who wouldn’t be sick of standing behind exhaust pipes of idling city buses and tour buses? who wouldn’t be sick of working in the hot summer with no shades and hot asphalt. I hate the summers at central park. always a horse passing out from heat exhaustion. The horse-drawn carriage business is not vital to New York City; tourists visit our City for many other reasons. In 2005, 18.9 million of the roughly 42 million visitors to New York visited museums, art exhibitions, performances, gardens, zoos, and historic/heritage sites. In addition NYC is world famous for its shopping and restaurants. The idea that tourists are drawn to visit New York City simply to take a ride in a horse-drawn carriage is absurd and, in any event, no justification for this cruel trade. In fact, some visitors to this country are appalled by the sight of these horses with their chipped hooves and dirty coats as they stand, in their own excrement, in the hot sun without shade and adequate water, and in the freezing cold weather, all the while breathing in the fumes of taxis, cars and buses. London and Paris are tourist destinations as well and they do not have this type of business. “Compassion”? How about compassion for those poor horses who endure hardship every day of their shackled lives on the streets of New York City! I was in Shamrock Stables years ago with an ASPCA officer and it is a hellhole for those animals. This industry’s time has come and gone. There is no excuse for animal abuse! Other people find new careers; now it’s time for the carriage drivers. Why has NYC been subsidizing this private, all cash business to the tune of $55,000 a month? Isn’t it enough that taxpayers pay for the cleanup of horse-manure all over the city streets and Central Park? The horses aren’t the problem, all the cars are! More land, and less pavement. More nature, and less man-made. So the Dept of Ed rented them this space at 5 grand a month instead of market value (avg. 50,000/ month) for 10 years. That is a loss for taxpayers of $450,000. No wonder the city is closing firehouses and firing teachers. All the nepotism and backdoor dealing has robbed the taxpayers. who cares if they are Irish? Stop playing the race card. this industry offers no revenue for the taxpayers and they hire mostly illegal mexicans and turkish and the income isn’t reported. This industry makes this city look and smell like a third world country. Hard to have an opinion either way. Carriage horses are a nuisance. More luxury apartments, though? Does Michael Bloomberg have a creative bone in his body? How about people-based strategies for a change? Typical of the Bloomberg administration. Shutter a business that has operated for more than 40 years. Build more housing in an overcrowded city in what is already one of the most trafficked neighborhood around. And build a new school, I thought we could not pay the teachers we have already. That is a block full of operating businesses, I don’t understand the economic benefit of closing businesses and putting people out of work. At the rate we are doing this the places to work in this city will be in retail or temporary construction jobs, is that sustainable. Plan 2030 which includes 1 million more people in a finite space with inadequate transportation, is a farce and will be looked back on as a joke. What will happen to all these poor horses if the stable closes? I hope the TIMES will do a follow-up article, and raise public awareness, so that these horses do not end up in a slaughterhouse somewhere. >horses do not belong on the congested streets of NYC! Nevermind that 100 years ago ONLY horses were pulling carriages and wagons on the streets of NYC. I just hope things don’t get worse for the horses. I agree the carriage business is lousy for the poor creatures, but if the carriage owners decide the available alternative lodgings are too expensive or inconvenient, the horses are likely to wind up on a plate in Osaka with A-1 sauce. Don’t we have enough luxury housing already? Doesn’t the Bloomberg administration have any plans that aren’t luxury housing or tourist treats? How about decent housing for regular working New Yorkers that aren’t millionaires? How about showing New Yorkers the consideration they are reserving for tourists and the international mega-wealthy? ASW, the horses go to slaughter anyhow after years of abuse. it is time to end this exploitation and cycle of abuse. if these people care about the horses then turn them in to the ASPCA and other rescue groups to retire them finally. Unlike other struggling businesses, the carriage trade has always enjoyed a high level of favoritism by the city government … from subsidizing their rent; to looking the other way when they cheat tourists or violate the current laws. They are the favored child. Why is anyone’s guess. I see that they are now playing the race, pity and compassion card. Wanna bet that the city will bail them out big time? I say it is time for them to go. Save the horses. Ban the industry. Given the city’s budget issues, it’s hard to understand why it would be subsidizing a private business like this – especially one that is cash-based and unable to document how much tax revenue it provides to NYC. If the owners can’t afford to pay market rate for the large amount of space necessary to stable their horses, perhaps the carriage business is simply not sustainable in a 21st century city and it’s time to transition to a new business. I sincerely doubt that any sane minded tourist would visit N.Y. just for the privilege of witnessing these poor abused animals hauling around a bunch of uninformed and idiotic passengers in the freezing rain and cold of the winters or the heat and humidity of the summers while trying desperately to breathe behind a bus or car spewing its toxic exhaust fumes! And, ’sick horses’ you say? You too would be sick under such cruel and inhumane treatment. Both London and Paris have banned this torture and inhumanity and N.Y. should duplicate the ban. Until such time, I spend my money in cities that do not condone, or support, such a medievel ‘tradition’. Perhaps the mayor can turn some major mid-town Manhattan street into a no-car horse-only venue for tourists. Isn’t he planning to add 34th St from Macys to the Empire State Bldg into a no-car zone? Lets put a stable in the middle of the street and surround in by seating for tourists waiting for horses to ply their trade in the newest no-car zone. Of course, venders will have to bring the horse supplies to the stable by hand, as trucks will have been banned. While I am not a supporter of the carriage horse businesses, I do think most opponents are painfully naive about the consequences of “just shutting them down.” Please, if you are concerned, get involved in taking care of these horses and all retired work horses. Otherwise, you’re just sending them to the slaughterhouse with your good intentions. We need more schools, the classes are overcrowded as it is and it is a shame that the Dept of Ed rented this bldg way below market value. The industry is cruel and makes this city look pre-historic. Lets focus on the children and forget about this cruel industry. I don’t want to continue subsidizing this industry any long. Unfortunately, the horses have been falling through the cracks for years right into the auctions on their way to slaughter. They have no protection under the law. Never did. So for JS to suggest that opponents of the carriage business are “painfully naive” only shows how naive most people are about what happens in this trade. Going to auctions would be nothing new. The industry sheds over 70 horses each year. Intro 92, which will soon be combined with Intro 86 and will close up that loophold and mandate the horses be adopted to good homes or sanctuaries. If Shamrock is forced to close down, they should reach out to others to save those horses. The owners are the ones who will send the horses to auction. It will be on their conscience. I remember visiting New York as a child and loving the chance to take a ride in a horse-drawn carriage, but perhaps it’s not very good for the horse. How about giving people a similar ride in Central Park, or set in nearby countryside? These horses are already in a lose-lose. Their jobs and lives are a misery to begin with. But like most draft horses, their options are limited. The number of people who own draft horses as pleasure horses are significantly lower than those who own lighter riding horses. They are truly the last of the workhorses. Not to mention, priced per pound, they’re more valuable than riding horses at the slaughterhouse. It would be nice if NYC or the ASPCA had some oversight in the fate of the evicted horses. 26. great points have already made, at the end of the day a dark closet in midtown mahattan is no place for a horse. Mr. McKeever should be grateful for the free ride he has gotten, and show have compassion for the horses by retiring them to a no kill shelter. Horses should not be working in the city. It’s all about making money for these people, and the horses do suffer. Anyone knows that these carriage rides are strictly for the tourists. Native New Yorkers wouldn’t be caught dead in a horse drawn carriage. I drove carriages in Central Park for two years to help pay for college, and I can testify that the horses were always, repeat always, very well cared for. Many drivers owned their own horses, and their feelings for them were tender and, yes, loving. Those owned by the stable represented a considerable investment and were crucial to doing business. The horses were well-fed — everyone left the stable with a bucket of oats — and I never saw a horse struck or abused. There were nights when they worked hard, but never to exhaustion. I have seen human beings work harder and longer and be honored for it. Anyone who knows even a little about horses knows that they like to work. Let them. Make sure that they’re safe and well cared for, or course. But don’t sentimentalize them or this issue. My family has horses and I can say for certain that the streets of NYC—working all day in all weather is NO LIFE FOR A HORSE. They never have a chance to run around in a field and enjoy the life they were born to live—free from working to make some man some money. Dear tourists, please do not partake in this cruelty. Dear NYCers please educate your friends and tourists as to why this cruelty must end now. Dear NYC, join the rest of the world and end carriage horses in our city TODAY. Thank you. Andrew F., it is you who are mistaken. Work is a human concept and I know humans who don’t like to work. What is your point? These horses are deprived of a nature life and forced to pull buggies with large people all over the city in all types of weather. Summer is the worst. Ask any doorman and he will tell you how he helped hosed the horses on the streets who passed out from heat exhaustion. it is love of money and not love of horses that sustain this industry for too long. if you love them so much then why dump them into slaughter after years of abuse??? Ah, I see the animal rights keyboard warriors are at it again. Sorry, but this issue has nothing to do with you. Go find a cheeseburger or a fur store to embarrass yourselves in front of. Better yet, go get a life. Grand Central Park, Grand Horse drawn carriages. Despite the pitfalls, that is an “icon” of New York City and Central Park. Take that away and NYC is just a “city”. To the few advocates for the industry, it is you who are naive. Do you not know that the horses already do end up at slaughter auctions? Have you ever done a Freedom of Information Law (FOIL) request to analyze how many horses “disappear” off the rolls each year? The carefully constructed loopholes in existing law allow for it. There is no language in the law that addresses humane disposition of the horses. Save the horses. Ban this industry. No one visits New York City to see this sad spectacle. To those who are sounding off without understanding the issues, I urge you to read about then-Comptroller Thompson’s audit of the industry in 2007; the Times published at least two articles on this mismanaged and underregulated industry in September of 2007. Mr. Fetherston, your comment only displays a fundamental ignorance of horse welfare. NYC stables fail by a long shot at meeting the minimal “best practices” standards as established by the state of New York (see: New York State Horse Health Assurance program). Veterinarians, including equine experts, have testified and delineated in withering detail how poor these horses’ working and living conditions are. Those who say otherwise are either poorly equipped to work with horses, or they are liars. Well said Daniel! (#30) —Work is a human concept and I know humans who don’t like to work. As an Animal Control Officer for 25 years in Canada I worked at the border where trucks full of horses frequently crossed the border to be slaughtered. Love your dog? Hello horse meat. If I am not mistaken the slaughter of horses is forbidden in the U.S. and they must be trucked long distances to Mexico and Canada to be “rendered”. Tragedies of truck floors falling out and accidents on the highway were not uncommon. Abandoned and abused horses were often taken advantage of, including the ones from Federal programs that were being protected in the midwest. Animals taken from farms by the ASPCA also have ended up this way. ‘Do gooders’ adopted 100’s for protection then sent them for slaughter a year later. A lot of this was done under Federal and State protection programs. They’re better off in New York or going to a home where they are “guaranteed” their safety. As a horse owner and lover, it always makes me wince when I go into NY city and see the carriage horses lined up waiting for customers. Their existence in the city is a dismal one and should not be supported by any animal lover. I enjoy the city but live in the country where my horses have pastures to graze in and wooded trails to travel on. The time for this type of tourist industry is long past. This horrific industry has to end!!!! Can we just end it!! Bloomberg, Hello! Can we have some compassion for these poor horses. I work nearby and it tears my heart out to see these poor animals in the winter and in the summer in the harshest of weather. I even saw a few on a horribly rainy day! Who the hell is going to take a carriage ride out in the rain!!! The driver had on his rain gear, did they or do they even dry the horses after having them out??? NEW YORK CITY, CAN WE TELL OUR POLITICIANS TO END THIS HORRIBLE INDUSTRY???? It’s time to retire these poor animals to sanctuaries. Honestly the tourists will not miss this part of NYC!!!! We Will have to term them out again as we did before. City council woman Karen kosowitz or something like that is back in the city council. We termed her out after she put those poor horses outside the park. Now she is back. Can’t just get rid of them easily but we will put them out for supporting animal cruelty. Let the carriage owners pull the carriages instead of the horses. And have them sleep in the stables while we’re at it. The City should not be subsidizing cruelty. The City should ensure that the horses are retired to a safe, rural environment and let this irresponsible business whither away. Save the horses. Get rid of the drivers. Whatever else is said – Suzanne – that is a great photo. The combination of the white horse, the striped shirt and the peeling white paint on the brick wall is striking. The NYT should definitely enter that for a feature photo Pulitzer. Why everybody has to go extreme, OK, go ahead and banish all carriage-horses to Pennsylvania and its drivers to Ireland? Why can’t there be a middle way, and a smooth transition such as a state-of-art stable for all urban equine, including mounted unit, in Central Park? it may give horses a break from hustle and bustle of midtown traffic, and some revenue for Parks Department. Be fair! Moderation, many comments up there are so not-New York. The carriage drivers, under different assumed names, are using the pity issue here in a different way – to try to convince you that if the industry shuts down, the horses will go to slaughter. DON’T BUY IT. There are several things wrong with this argument. 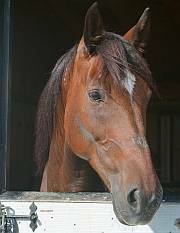 First of all, many of the horses go to auctions now because of the loophole in the law – 17-329 Disposition of licensed horse. – part of the Administrative Code of the City of NY, which has no oversight for where the horses end up. Approximately 70 horses disappear from the Department of Health registry each year. (this is from Freedom of Information) Surely some end up at the auctions, but there is no way to tell — and they have no protection. The choice of what to do with a horse who is no longer wanted is entirely up to the owner/carriage driver. He can decide to keep the horse and retire her to a nice farm — or he can bring her to auction to sell her for a few bucks to recoup his lost. Drafts are bigger and get more $$$$$ from killer buyers. Read about Lilly, a NYC carriage horse, who was rescued from New Holland Auctions. http://banhdc.org/archives/ch-hap-lilly.html At 18.2 hands, but a few hundred pounds under weight, Lilly was a big girl. Poor Lilly died a few years back. Her vet/care giver said it was largely due to her former hard life on the street. This poor girl was so distraught when she went to the rescue to live that it took quite a while to get her to trust people again. At least we know that she spent the last year of her life very much loved sharing it in freedom with another horse and a donkey. I will always treasure my time with her and she is honored on our web site. No thanks to the NYC owners who dumped her at the auction. It is totally disingenuous for the carriage drivers to warn about horses going to slaughter when they are the ones who have been sending them to auction. Even now with Shamrock possibly closing down, it is up to them to find the best possible homes for these horses – not to send them back to the Amish where they work 12 hours a day. The City should begin the process of closing down the industry by letter Shamrock Stables shut its doors permanently – and to stop subsidizing them. I always wondered why the Mayor and the City Council so adamantly insist on supporting (and in this case subsidizing) an industry that is cruel and ugly. Reading here what “rent” this business has been paying to the city it is now clear that some under the table money must have been going into someone’s pockets. And, still they claim that this is good for New York’s revenue!! We, the voting taxpayers are subsidizing animal cruelty. “Family owned business” – NY Times, that is the sickest description I ever heard of for a couple of guys who rent stalls to others in the saddest and most inappropriate setting for a horse imaginable. Just take a look at this picture, which is probably the best possible shot of those miserable concrete prison cells where a horse cannot lie down and stands on concrete (oh – it has straw sprinkled on it!). Some family values this business represents! It appears the NYPD turns a blind eye to traffic violations when carriages are involved. The drivers think nothing of going through red lights at any time, going the wrong way, making illegal turns – U or otherwise and in general playing chicken with motor vehicles and pedestrians. Why do so many commenters only see the word luxury and ignore the fact that this development is happening with the involvement of HPD and will provide moderately priced housing that will also include a new school and open space? Time for the glue factory for those horses. If they do not have a carraige to pull, they have no purpose, so put them down, and tell yourself you did the poor horsies a favor. New York should be shut down. It is not a good environment for hoses or humans.It is a filthy ,loud ,rude environment. Ban everyone and everything from it and graze the buildings and let nature return it back to an island. How does that sound mortals! just stricken to see the carriages in traffic. My heart enveloped them and returning home sought info on how they were cared for. I see I am not the only one. I support the idea of old time cars in the park. Let the horses live in peace at pasture with clean water and grass on which to graze. Thank you. Keep up the work to ban the use of horses.